Browse our range of hygiene sweepers, all manufactured to the very highest standards and offering excellent bristle retention. Superbly anchored, densely packed bristles deliver long-lasting cleaning performance, able to handle daily and sustained use. Designed and made to maximise hygiene in a wide range of environments, Klipspringer’s range of colour-coded hygiene sweepers are available in 11 distinct colours and a range of widths and filament types. 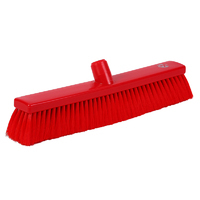 Look no further for high quality, cost effective hygiene floor sweepers from Klipspringer – the last word in industrial class plastic sweeping brush heads that help organisations such as food factories maintain hygiene, day in, day out. Order online today for same day despatch. Dense high shine brush bodies provide effective anchorage for packed bristles. PBT filaments for best performance in damp/wet conditions or PP alternative for predominantly dry applications. 4 width options and 11 colour choices qualify these brushes for No.1 position. Available in 4 working widths and in 11 strong colours, these excellent hygiene brushes have first class ratings for effective long lasting performance in virtually every application. 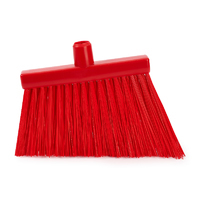 Polyester PBT filaments in 80% of the sweepers offered ensures success across the board! Super soft hygiene brushes extremely effective in dry fine dusty conditions. Closely packed with 0.2mm PBT filaments, these colour coded hygiene brushes are available in 6 distinct colours. 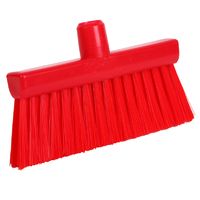 Effective both for fine dry sweeping or working with water where the split filaments help to hold water within the brush head. Excellent for wall wash or vehicle surfaces. These colour coded food contact approved hygiene brushes are available in 3 widths, 2 filament types and 5 colours. Many years of manufacturing experience guarantees that KsPrism brushware have an excellent track record for bristle retention. 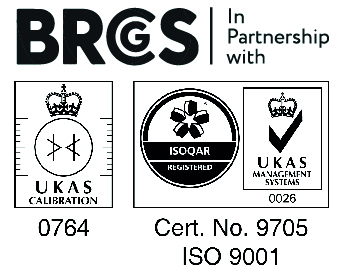 For those who seek complete assurance, these hygiene bodies are moulded to allow for resin to be added to surround each bristle clump and penetrate to the roots, removing opportunities for contaminating filament sockets. Combine 2 lead rows of 0.7(mm) stiff filaments with 3 rows across the rear of softer 0.3(mm) filaments to loosen and then collect debris. As all rows are polyester PBT, these hygiene brushes have a unique role in effective sweeping in most conditions. 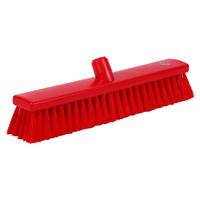 Sweeps dry smooth floor areas effectively gathering large and small debris. Works with the W1050 lobby pan.and will take either H4111 KsPrism aluminium handle (300mm) or H4110 KsPrism aluminium handle (800mm). Sweeps dry smooth floor areas effectively gathering large and small debris. Brush filaments are detectable with metal and x-ray detecting equipment. Filled with 0.6mm polyester PBT bristles these hygiene brushes sweep safely and effectively. Standard thread to fit all KsPrism handles.